Preheat oven to temperature listed on canned crescent roll sheets. Grease a large, flat baking sheet. Roll out one sheet of crescent dough. Then roll out the second sheet, laying it next to the first sheet. Pinch together the center to make one large sheet of dough. Using your hands, gently roll up the edges of the dough around the outside edges to form a small crust. Bake the crescent dough crust according to package directions. While the dough is baking, cook the hamburger, salt, and pepper in a large skillet. Drain the grease, then return the cooked hamburger to the pan, adding the taco seasoning per package directions. In a small saucepan, add the can of refried beans plus 1 tablespoon of the adobo sauce from the canned chipotle chiles. Stir to combine and heat over medium-low heat until warm. When the dough is finished baking, remove from oven and set aside. To start assembling your taco pizza. Spread a layer of the beans across the entire cooked pizza crust. Next, add a layer of taco sauce. Then, add a layer of the cooked seasoned hamburger meat. Place back into the oven and cook for an additional 5 minutes. Remove pizza from oven and top with the shredded cheese. Place the pizza into the oven under the broil setting just until the cheese is melted. Remove from oven and let cool for a few minutes. 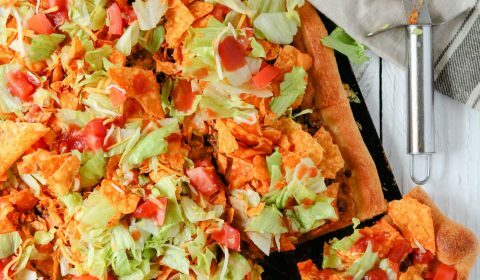 Crush the Doritos, then sprinkle on top of the entire pizza. Add the chopped lettuce and tomatoes and any other topping you would like. Drizzle with additional taco sauce or salsa and serve.